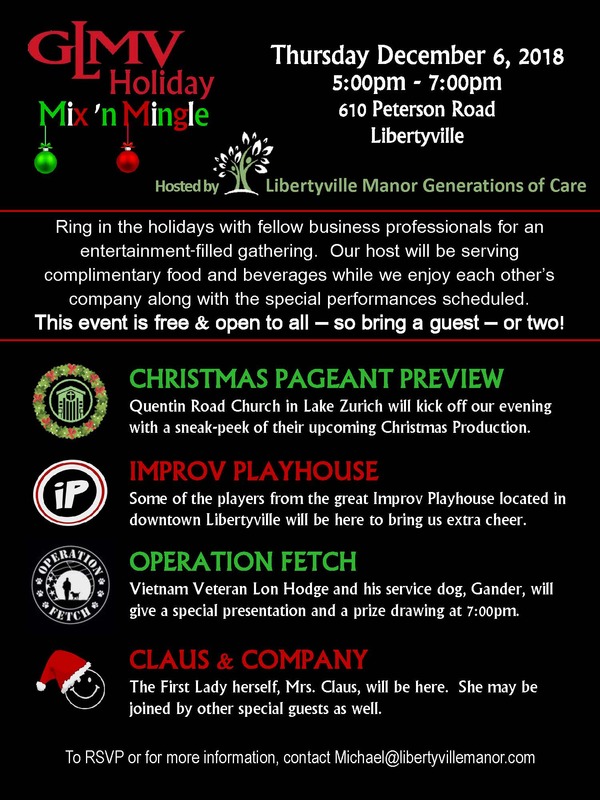 Join your fellow business professionals for a complimentary festive after hours mix 'n mingle at Libertyville Manor. Food, Beverage, Raffles, Networking, Camaraderie, Entertainment by Improv Playhouse, and more! * Quentin Road Christmas Pageant Mini-Performance (Maybe 15 minutes, one or two songs) at about 5:15 or so. * Lon Hodge & Gander Operation Fetch Grand Prize Drawing at 7:00 p.m.
* Mrs. Claus and possibly, reindeer permitting, Santa stopping in.